At the 1970 expo in Osaka, as at other international exhibitions, New Zealand promoted the beauty of the country to attract tourists and create an image of a clean, natural paradise. 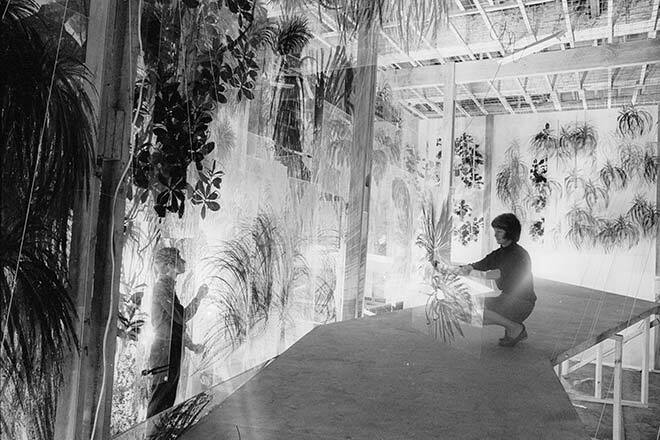 A major attraction at Osaka was a 'bush walk' consisting of 600 acrylic panels that reproduced native foliage and hanging ferns. Here, the artist Susan Skerman is hard at work installing the panels. They were subsequently brought back to New Zealand and hung in Parliament's Beehive building in Wellington.